One of the most influential men in Bergamo’s history, military leader Bartolomeo Colleoni, died 535 years ago today. Colleoni spent most of his life in the pay of the republic of Venice, defending Bergamo against invaders. But he is remembered as one of the most honourable condottieri of his era, carrying out charitable works and agricultural improvements in Bergamo and the surrounding area when he was not involved in a military campaign. In later life he lived peacefully with his family at his castle in Malpaga, to the south of Bergamo . 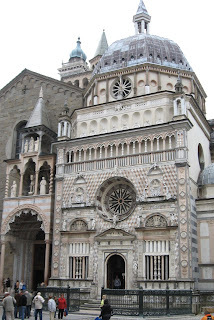 Towards the end he turned his attention to designing a building to house his own tomb in the Citta Alta (upper town), which was to give Bergamo its most ornate and celebrated building, the Cappella Colleoni (Colleoni Chapel). He commissioned the architect Antonio Amadeo to design an impressive chapel where he could be buried with all the insignia of a captain of the Venetian republic. The sacristry of the Basilica di Santa Maria Maggiore in Piazza Duomo had to be demolished to make way for this. Inside the chapel he designed an elaborate two-tier sarcophagus surmounted by a golden statue of Colleoni on horseback. Colleoni died on 2 November, 1475 and in accordance with his own instructions his body was placed in the lower sarcophagus, where it remains today. 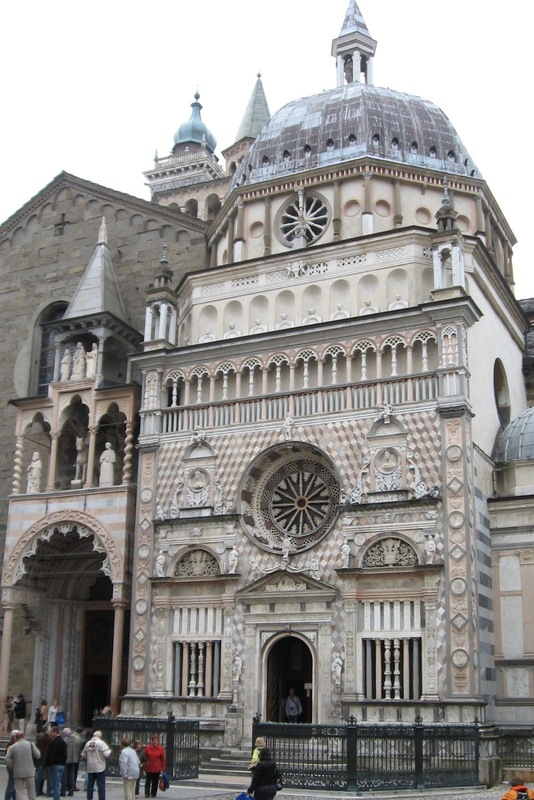 The Cappella Colleoni is now considered to be one of the finest examples of Renaissance architecture in Italy . Condottieri were leaders of troops in medieval times in Italy who worked for the powerful ruling factions, often for high payments. Bergamo’s Bartolomeo Colleoni was unusual that he remained steadfast to one employer, the republic of Venice , for most of his career. During a period of peace between Venice and Milan he worked briefly for Milan, but they never fully trusted him and eventually he was arrested and imprisoned. On his release, he returned to work for Venice and stayed faithful to them for the rest of his life.